Percutaneous coronary intervention (PCI) has undergone major advances including the evolution in stent technology, from bare metal stents (BMS), to their drug eluting counterparts, to the development of bioresorbable scaffolds (BRS). The primary notion of BRS was to facilitate complete vascular healing and restore normal endothelial function following the resorption of stent scaffold while providing equivalent mechanical properties of a metallic drug eluting stents (DES) in the earlier stages. BRS provide attractive physiologic advancements over the existing DES and have shown promising results in initial clinical studies albeit with small sample sizes. Their use has been primarily restricted to patients recruited in clinical trials with limited real-world applicability. Thus, data from larger randomised control trials is awaited. The major objective of this article is to review the evidence on BRS and identify their clinical applicability in current interventional practice. Percutaneous coronary intervention (PCI) is one of the most commonly performed procedures in cardiology. More recently, the limitations of rigid metallic stents have led to the development of bioresorbable scaffolds (BRS). The earliest version of bioresorbable stent developed and tested in humans in 1990 was the Igaki-Tamai stent. It featured a thermal and balloon expandable stent that showed good outcomes at six months1 as well as long-term2 with neointimal hyperplasia similar to bare metal stents (BMS). The use of heat expansion, however, limited the clinical applicability of this device due to concerns of arterial wall necrosis with consequential platelet adhesion and stent thrombosis (ST).3 The development of new generation of BRS with improving mechanical performance is believed by some to be the next evolutionary leap in interventional cardiology. The major objective of this article is to review the evidence on BRS and identify their clinical applicability in current interventional practice. In earlier days of balloon angioplasty, the adverse coronary vessel remodelling secondary to neointimal proliferation and extracellular matrix deposition as well as vessel recoil led to high restenosis rates.4,5 This early luminal loss was largely overcome by development of BMS that avoided vessel recoil and constrictive effects of vessel remodelling as well as any coronary flow impairment due to local dissections.6,7 However, the neointimal proliferative reaction to foreign body (metallic stent) resulted in greater intimal proliferation.8 The volume of neointimal proliferation was improved by introduction of drug eluting stents (DES) with anti-proliferative agents bound to stent polymers.9 Despite extensive literature on reduced revascularisation rates with DES, there have been multiple reports and safety concerns regarding occurrence of late and very late ST with DES.10 It was thought to be due to delayed and at times incomplete endothelialisation. This was a result of chronic inflammation from hypersensitivity reaction to the metallic stent and/or the durable polymers, which attenuates vascular healing.11–13 The presence of drug elution and a metallic stent are also believed to interfere with endothelial function.14,15 In addition, the persistent metallic scaffolding would subsequently limit expansive remodelling of the coronary artery. Loss of cyclic strain relief and protruding struts with resultant abnormal shear stress and strut fracture are other potential reasons for late cardiac events. Although safety and radial strength of another bioresorbable stent, the IDEAL Poly (anhydride ester) salicylic acid stent39 were demonstrated in a 12-month follow up of a small (n=11) number of patients, the neointimal suppression was deemed to be insufficient due to low dose and rapid elution of sirolimus.40 A revised version with higher dose of sirolimus and optimised stent design with thinner struts is undergoing pre-clinical trials. The chronic scaffold recoil noted with ABSORB Version 1.0 in Cohort A trial occurs secondary to loss of radial strength during resorption and is not observed with non-absorbable DES. Likewise, the in-vivo resorption of the scaffold and its mechanical strength do not have a linear relationship.38 This might make the decline in device’s mechanical performance with minimal resorption or changes in stent mass unpredictable. Conversely, the DREAMS magnesium based scaffold showed better conformability with superior strut apposition in the BIOSOLVE-I trial though with other limitations noted above.42 The other notable limitation of polymer (PLLA) based BRS is the lack of radio-opacity, which obligates the use of radiopaque markers. The pace of scaffold resorption can vary depending on the PLLA manufacturing process. Thus, every device needs to be tested appropriately for in-vivo biocompatibility. This is important since previously published literature has demonstrated the influence of scaffold’s molecular weight on the degree of inflammation,48 which could further influence the neointimal response. Additionally, with varying absorption times, the ideal resorption duration of scaffolding remains to be elucidated. On the basis of previously published IVUS study that showed negative vascular remodelling for up to six months8 an ideal scaffold should provide protection against negative remodelling for at least six months though this merits further confirmation. The current generation of DES has demonstrated improved outcomes with especially reduced rates of both late and very late ST.49 Indeed, emerging literature involving recent post-hoc analysis of pooled data from major trials demonstrated no adverse thrombotic events after earlier discontinuation of DAPT. This poses several questions for emerging technology as BRS including feasibility of designing adequately powered trials to prove the superiority of BRS over currently available DES.50 Whether BRS would further reduce DAPT requirements, lower stent fracture complications and even improve coronary vasomotor function over long term remains to be demonstrated in larger clinical and in-vivo physiological studies. Future pre-clinical studies focused on extensively studying pathophysiological underpinnings of BRS mechanisms are imperative. Furthermore, the real clinical implications of vasomotor restoration phenomenon would need further evaluation. BRS offer an attractive theoretical advantage in absolution of late and very-late stent thrombosis. Despite promising clinical outcomes compared to existing DES, their use has been primarily restricted to patients recruited in clinical trials with strict eligibility criteria. Larger comparative trials with critical safety and efficacy analysis of newer BRS with improving designs and biomechanical properties are nearing completion. We eagerly await these results before the widespread use of BRS can be recommended, especially considering improving technology and outcomes with third generation metallic DES. Tamai H, Igaki K, Kyo E, et al. Initial and six-month results of biodegradable poly-l-lactic acid coronary stents in humans. Circulation 2000 Jul 25;102(4):399–404. Nishio S, Kosuga K, Igaki K, et al. Long-Term (>10 Years) clinical outcomes of first-in-human biodegradable poly-llactic acid coronary stents: Igaki-Tamai stents. Circulation 2012 May 15;125:2343–53. Onuma Y, Serruys PW. Bioresorbable scaffold: the advent of a new era in percutaneous coronary and peripheral revascularization? Circulation 2011 Feb 22;123:779–97. Sigwart U, Puel J, Mirkovitch V, et al. Intravascular stents to prevent occlusion and restenosis after transluminal angioplasty. N Engl J Med 1987 Mar 19;316:701–6. Nobuyoshi M, Kimura T, Nosaka H, et al. Restenosis after successful percutaneous transluminal coronary angioplasty: serial angiographic follow-up of 229 patients. J Am Coll Cardiol 1988 Sep;12:616–23. Luo H, Nishioka T, Eigler NL, et al. Coronary artery restenosis after balloon angioplasty in humans is associated with circumferential coronary constriction. Arterioscler Thromb Vasc Biol 1996 Nov;16:1393–8. Fischman DL, Leon MB, Baim DS, et al. A randomized comparison of coronary-stent placement and balloon angioplasty in the treatment of coronary artery disease. 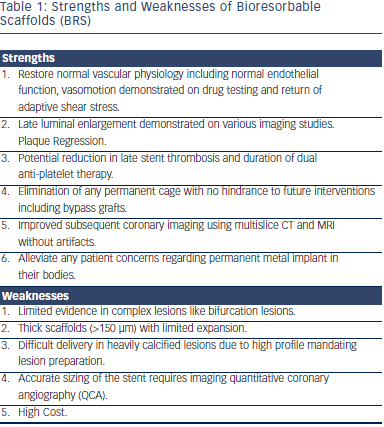 Stent Restenosis Study Investigators. N Engl J Med 1994 Aug 25;331:496–501. Hoffmann R, Mintz GS, Dussaillant GR, et al. Patterns and mechanisms of in-stent restenosis. 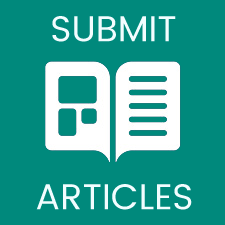 A serial intravascular ultrasound study. Circulation 1996 Sep 15;94:1247–54. Sousa JE, Costa MA, Abizaid A, et al. s-coated stents in human coronary arteries: a quantitative coronary angiography and three-dimensional intravascular ultrasound study. Circulation 2001 Jan 16;103:192–5. Stettler C, Wandel S, Allemann S, et al. Outcomes associated with drug-eluting and bare-metal stents: a collaborative network meta-analysis. Lancet 2007 Sep 15;370:937–48. Joner M, Finn AV, Farb A, et al. Pathology of drug-eluting stents in humans: delayed healing and late thrombotic risk. J Am Coll Cardiol 2006 Jul 4;48:193–202. Stefanini GG, Kalesan B, Serruys PW, et al. Long-term clinical outcomes of biodegradable polymer biolimus-eluting stents versus durable polymer sirolimus-eluting stents in patients with coronary artery disease (LEADERS): 4 year followup of a randomised non-inferiority trial. Lancet 2011 Dec 3;378:1940–8. Wenaweser P, Daemen J, Zwahlen M, et al. Incidence and correlates of drug-eluting stent thrombosis in routine clinical practice. 4-year results from a large 2-institutional cohort study. J Am Coll Cardiol 2008 Sep 30;52:1134–40. Togni M, Windecker S, Cocchia R, et al. Sirolimus-eluting stents associated with paradoxic coronary vasoconstriction. J Am Coll Cardiol 2005 Jul 19;46:231–6. Hofma SH, van der Giessen WJ, van Dalen BM, et al. Indication of long-term endothelial dysfunction after sirolimus-eluting stent implantation. Eur Heart J 2006 Jan;27:166–70. Serruys PW, Onuma Y, Dudek D, et al. Evaluation of the second generation of a bioresorbable everolimus-eluting vascular scaffold for the treatment of de novo coronary artery stenosis: 12-month clinical and imaging outcomes. J Am Coll Cardiol 2011 Oct 4;58:1578–88. ABSORB III Randomized Controlled Trial (RCT) (ABSORB-III) . Abbott Vascular; [cited 2014 Jun 23]; Available from: http:// www.clinicaltrials.gov/show/NCT01751906. Serruys PW, Morice MC, Kappetein AP, et al. Percutaneous coronary intervention versus coronary-artery bypass grafting for severe coronary artery disease. N Engl J Med 2009 Mar 5;360:961–72. Mahnken AH. CT Imaging of Coronary Stents: Past, Present, and Future. ISRN Cardiol 2012;2012:139823. Spuentrup E, Ruebben A, Mahnken A, et al. Artifact-free coronary magnetic resonance angiography and coronary vessel wall imaging in the presence of a new, metallic, coronary magnetic resonance imaging stent. Circulation 2005 Mar 1;111:1019–26. Erbel R, Bose D, Haude M, et al. [Absorbable coronary stents. New promising technology]. Herz2007 Jun;32:308–19. Ormiston JA, Serruys PW. Bioabsorbable coronary stents. Circ Cardiovasc Interv 2009 Jun;2:255–60. Ormiston JA, Serruys PW, Regar E, et al. A bioabsorbable everolimus-eluting coronary stent system for patients with single de-novo coronary artery lesions (ABSORB): a prospective open-label trial. Lancet 2008 Mar 15;371:899–907. Rzeszutko L, Depukat R, Dudek D. Biodegradable vascular scaffold ABSORB BVS - scientific evidence and methods of implantation. Postepy Kardiol Interwencyjnej 2013;9:22–30. Serruys PW, Ormiston JA, Onuma Y, et al. A bioabsorbable everolimus-eluting coronary stent system (ABSORB): 2-year outcomes and results from multiple imaging methods. Lancet 2009 Mar 14;373:897–910. Onuma Y, Serruys PW, Ormiston JA, et al. Three-year results of clinical follow-up after a bioresorbable everolimus-eluting scaffold in patients with de novo coronary artery disease: the ABSORB trial. EuroIntervention 2010 Sep;6:447–53. Onuma Y, Dudek D, Thuesen L, et al. Five-year clinical and functional multislice computed tomography angiographic results after coronary implantation of the fully resorbable polymeric everolimus-eluting scaffold in patients with de novo coronary artery disease: the ABSORB cohort A trial. JACC Cardiovasc Interv 2013 Oct;6:999–1009. Okamura T, Garg S, Gutierrez-Chico JL, et al. In vivo evaluation of stent strut distribution patterns in the bioabsorbable everolimus-eluting device: an OCT ad hoc analysis of the revision 1.0 and revision 1.1 stent design in the ABSORB clinical trial. EuroIntervention 2010 Apr;5:932–8. Abizaid A, Costa JR, Jr., Bartorelli AL, et al. The ABSORB EXTEND study: preliminary report of the twelve-month clinical outcomes in the first 512 patients enrolled. EuroIntervention 2014 Apr 29. Diletti R, Serruys PW, Farooq V, et al. ABSORB II randomized controlled trial: a clinical evaluation to compare the safety, efficacy, and performance of the Absorb everolimus-eluting bioresorbable vascular scaffold system against the XIENCE everolimus-eluting coronary stent system in the treatment of subjects with ischemic heart disease caused by de novo native coronary artery lesions: rationale and study design. Am Heart J 2012 Nov;164:654–63. A Clinical Evaluation of Absorb™ Bioresorbable Vascular Scaffold (Absorb™ BVS) System in Chinese Population ~ ABSORB CHINA RCT. Abbott Vascular; [cited 2014 Jun 23]; Available from: http://www.clinicaltrials.gov/ct2/show/ NCT01923740. AVJ-301 Clinical Trial: A Clinical Evaluation of AVJ-301 (Absorb™ BVS) in Japanese Population (ABSORB JAPAN). Abbott Vascular; [cited 2014 Jun 23]; Available from: http://clinicaltrials.gov/show/NCT01844284. Dudek D, editor POLAR ACS: bio-absorbable platform in acute coronary syndromes. euroPCR; 2013; Paris, France. Simsek C, Magro M, Onuma Y, et al. Procedural and clinical outcomes of the Absorb everolimus-eluting bioresorbable vascular scaffold: one-month results of the Bioresorbable vascular Scaffold Evaluated At Rotterdam Cardiology Hospitals (B-SEARCH). EuroIntervention 2013 Sep 4. Kocka V, Maly M, Tousek P, et al. Bioresorbable vascular scaffolds in acute ST-segment elevation myocardial infarction: a prospective multicentre study ‘Prague 19’. Eur Heart J 2014 Mar;35:787-794. ABSORB STEMI: the TROFI II Study. ECRI bv; [cited 2014 Jun 23]; Available from: http://clinicaltrials.gov/show/ NCT01986803. Pollman MJ. Engineering a bioresorbable stent: REVA programme update. EuroIntervention 2009 Dec 15;5 Suppl F:F54–7. Garg S, Serruys PW. Coronary stents: looking forward. J Am Coll Cardiol 2010 Aug 31;56(10 Suppl):S43–78. Jabara R, Pendyala L, Geva S, et al. Novel fully bioabsorbable salicylate-based sirolimus-eluting stent. EuroIntervention 2009 Dec 15;5 Suppl F:F58–64. Jabara R. Poly-anhydride based on salicylic acid and adipic acid anhydride. EuroPCR; 2009. Erbel R, Di Mario C, Bartunek J, et al. Temporary scaffolding of coronary arteries with bioabsorbable magnesium stents: a prospective, non-randomised multicentre trial. Lancet 2007 Jun 2;369:1869–75. Haude M, Erbel R, Erne P, et al. Safety and performance of the drug-eluting absorbable metal scaffold (DREAMS) in patients with de-novo coronary lesions: 12 month results of the prospective, multicentre, first-in-man BIOSOLVE-I trial. Lancet 2013 Mar 9;381:836–44. Brown AJ, McCormick LM, Braganza DM, et al. Expansion and malapposition characteristics after bioresorbable vascular scaffold implantation. Catheter Cardiovasc Interv 2014 Jul 1;84:37–45. Basavarajaiah S, Naganuma T, Latib A, Colombo A. Can bioabsorbable scaffolds be used in calcified lesions? Catheter Cardiovasc Interv 2013 Apr 16. Gomez-Lara J, Diletti R, Brugaletta S, et al. Angiographic maximal luminal diameter and appropriate deployment of the everolimus-eluting bioresorbable vascular scaffold as assessed by optical coherence tomography: an ABSORB cohort B trial sub-study. EuroIntervention 2012 Jun 20;8:214–24. Ielasi A, Latib A, Naganuma T, et al. Early results following everolimus-eluting bioresorbable vascular scaffold implantation for the treatment of in-stent restenosis. Int J Cardiol 2014 May 15;173:513–4. Muramatsu T, Onuma Y, van Geuns RJ, et al. One-Year Clinical Outcomes of Diabetic Patients Treated With Everolimus-Eluting Bioresorbable Vascular Scaffolds: A Pooled Analysis of the ABSORB and the SPIRIT Trials. JACC Cardiovasc Interv 2014 Apr 10. Lincoff AM, Furst JG, Ellis SG, et al. Sustained local delivery of dexamethasone by a novel intravascular eluting stent to prevent restenosis in the porcine coronary injury model. J Am Coll Cardiol 1997 Mar 15;29(4):808–16. Palmerini T, Biondi-Zoccai G, Della Riva D, et al. Stent thrombosis with drug-eluting and bare-metal stents: evidence from a comprehensive network meta-analysis. 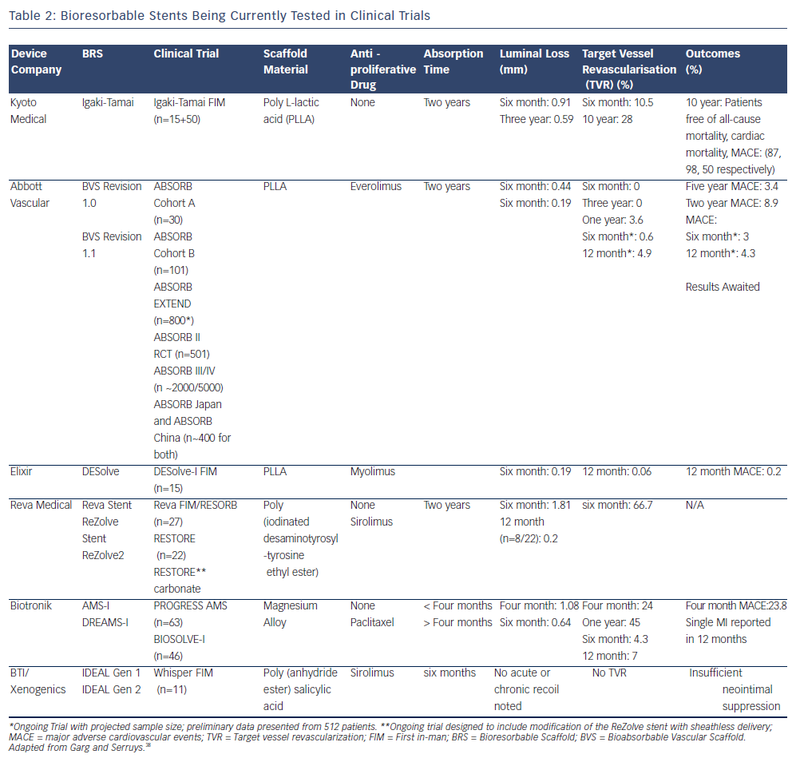 Lancet 2012 Apr 14;379:1393–402. Dauerman HL. The magic of disappearing stents. J Am Coll Cardiol 2011 Oct 4;58:1589–91. Claessen BE, Beijk MA, Legrand V, et al. Two-year clinical, angiographic, and intravascular ultrasound follow-up of the XIENCE V everolimus-eluting stent in the treatment of patients with de novo native coronary artery lesions: the SPIRIT II trial. Circ Cardiovasc Interv 2009 Aug;2:339–47. Ormiston JA, Serruys PW, Onuma Y, et al. First serial assessment at 6 months and 2 years of the second generation of absorb everolimus-eluting bioresorbable vascular scaffold: a multi-imaging modality study. Circ Cardiovasc Interv 2012 Oct;5:620–32.